Get the little ones going green early! From reusing second-hand items, to sporting cloth diapers, and sleeping sweetly in organic bedding, we have a handful of green baby-centric deals that will keep both parents and the little one happy. From clothes to toys and more, thrift stores have it all. And while you must be diligent in your purchases, there's no reason to be dressing up baby in designer threads: toddlers outgrow their clothes in a hurry. Like their clothing, toddlers also outgrow most strollers in a few years. And depending on how much you use it, your $300 investment could be better spent towards a college savings fund. By purchasing a gently used stroller, either from a friend whose little ones have outgrown it, a garage sale, or even eBay, you could be saving yourself about $100. According to Mother Jones, in 2005, American babies wore 3.6 million tons of disposable diapers, accounting for 2.1% of the country's municipal waste. Compare that to 1970, when American babies bottoms produced 350,000 tons, or 0.3%, of trash. Commercial diapers don't biodegrade for 500 years, which means that if you want to save the planet, consider using non-disposable products. GroVia hybrid diapers are designed so that the outer shells may be used for multiple diaper changes, and the inlaid soaker pads are washable. What's more, these diapers are adjustable and fit most babies 8 to 35 lbs. The pictured GroVia Live Package ($394 with free shipping) has enough diaper shells and soaker pads to raise your baby through potty training. Consumer Reports estimates that outfitting your an infant in disposable diapers until toddler-hood will cost a total of $2,500, which makes opting for the Grovia Live Package a savings of around $2,000 (excluding the cost of washing the diapers yourself). If you're going to go green with diapers, why not save on that all-important accessory they come in, too? The fact is that you'll inevitably trash your diaper bag from heavy use, so get something that's both recycled and recyclable. 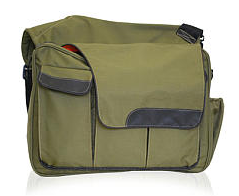 This one is for the Dads: the Diaper Dude Eco Diaper Bag ($84.14 with $7.46 s&h, a low by $2), pictured, is sporty and inconspicuous, but perfect for holding everything you'll need. Made from recycled materials and water bottles, this diaper bag includes an insulated bottle holder, and two mesh compartments: one for Dad, one for baby. What's more, a baby-needs checklist appears on the inside of the magnetic bag flap. As reported in Chasing Green, typical bedsheets and spreads are made of fabrics that may contain chemical treatments, pesticides, artificial colors, dyes, and hazardous flame retardants. Chasing Green lists and links to a number of websites where you can find safe bedding and linens, including The Natural Baby, which sells everything from organic pillows to snuggly blankets in the $25 to $80 price range. 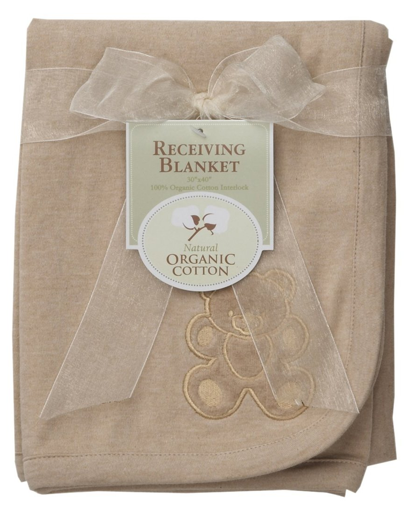 We're fond of the ABC Organic Embroidered Receiving Blanket ($9.99 with free shipping via Prime, a low by $2) in Mocha. This blanket is made from 100% organic cotton, is the perfect size (30x40"), and features an embroidered teddy bear on one side. If there's one time to consider produce and food that's organic, it's when you bring a child into the world. The little bit extra you'll spend on organic produce will keep your growing kid safe from an onslaught of pesticides, preservatives, and additives. And luckily you'll only be spending just a little bit more, with this deal: two packages of Earth's Best Organic Baby Food will set you back just $15 with in-store pick up (a low by at least $7) at Toys "R" Us. Select from 8- or 12-packs of baby food in various stages and keep your little one well fed. Having fun at bath time is as important for baby as washing away germs is for Mom and Dad. So, don't skip out on bubble baths! Earth's Best Bubble Bath in Lavender or Vanilla ($4.99 with free in-store pickup, a low by $5) is an organic bubble bath that baby and toddler will love. Its tear-free formula and soothing chamomile and aloe make for a clean and happy baby. What's more, this printable coupon for Rewards R Us Members at Toys R Us gets you 50% off a second Earth's Best item, which makes budget-conscious Moms and Dads happy, too. It's never too soon to instill the value of eco-friendliness in your little one. By simultaneously reducing carbon footprints — big and small — and saving money, these green deals are just the way to start. If you haven't found what you're looking for here, be sure to explore our baby and kids products for more savings. Lou Carlozo is a dealnews contributing writer. 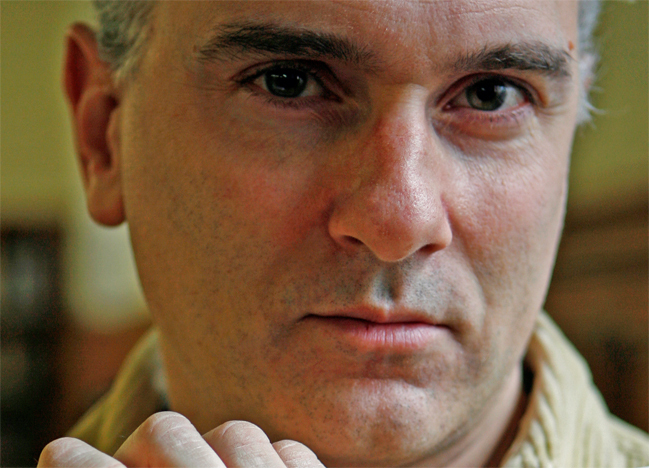 He covers personal finance for Reuters Wealth, and was most recently the managing editor of WalletPop.com, and before that a veteran columnist at the Chicago Tribune. Follow him on Twitter — @LouCarlozo63. You can also sign up for an email alert for all dealnews features.